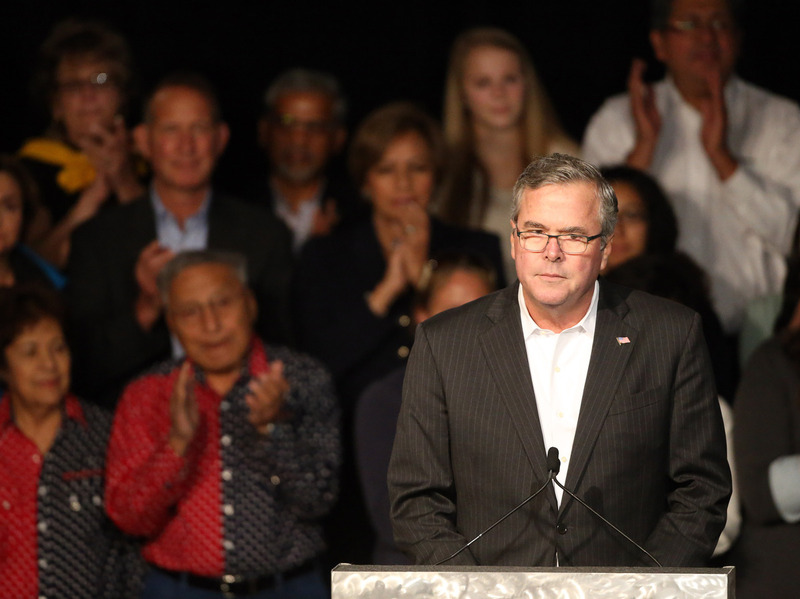 Will Jeb Bush Run For President? His Brother Says Maybe : The Two-Way George W. Bush says there's a good chance his brother will run for president in 2016. And he also thinks his family name shouldn't hold Jeb back if he does. Former Florida Gov. Jeb Bush pauses while speaking during a voting rally for state Republican candidates in Castle Rock, Colo., on Oct. 29. Former President George W. Bush is back in the spotlight. He's releasing a new book this week, called 41: A Portrait of My Father. And he's also speaking more openly about whether his brother, former Florida Gov. Jeb Bush, might one day run for president himself. George W. Bush spoke with NPR's David Greene in an interview that will air on Morning Edition on Tuesday. During their conversation, Greene asked Bush about his brother's possible presidential ambitions. George W. Bush said Jeb is considering a run. But he also said both Jeb and another potential 2016 candidate will have to decide if — and how — to run in the country's current political climate. "I mean, the environment is what it is. You don't get to rewrite the environment, and so Jeb has to think about whether or not he wants to be president, just like Hillary Clinton has to think about whether she wants to be president," said Bush. Bush also said his family name shouldn't prevent his brother from rising to the top of the GOP. "Some guy at one time said to me, 'You know, I don't like the idea of Bush, Clinton, Bush, Obama, Bush.' I said, 'Oh, OK.' I said, 'How do you like the idea of Bush, Clinton, Bush, Obama, Clinton?' And the point is that these may be the two best candidates their party has to offer." In a recent interview with CBS' Face the Nation, George W. Bush said there's a "50-50 chance" his brother Jeb will run for president in 2016. And he has previously said that he's been urging Jeb to enter the race. But Jeb Bush could have an uphill climb, should he choose to run. A recent ABC News/Washington Post poll found that among registered voters, only 26 percent think he'd make a good president — which ranks him higher than some of his potential Republican rivals, but falls short of a vote of confidence.